Ideally, a video game sequel should feature everything that worked about the first game and expand and improve upon it so that the the new entry doesn't feel like an expansion pack. Unfortunately, there was very little that worked about Agetec's Touch Battle Tank 3D, and Touch Battle Tank 3D 2 is basically more of the same. With the same bland level design, poor AI and awful controls, it's hard to tell the two titles apart, aside from different-coloured tanks and more levels. As in the original, players can choose between two different tanks to clear each stage. 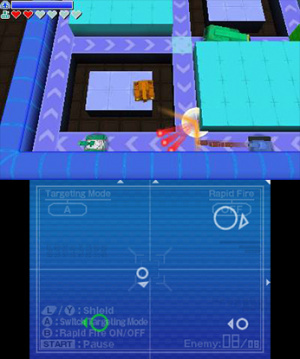 The purple tank is the "attack type," with the ability to charge shots, while the turquoise tank is the "defense type," which is equipped with a shield that bounces shots back at enemy tanks. We played mostly with the defense tank, mainly because it helped us get through each stage quicker. 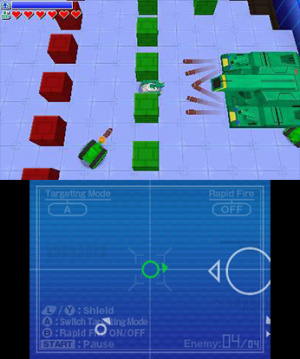 Touch Battle Tank 3D 2 gets old very fast — you eliminate all enemy tanks in a bland, grey "arena" and continue to the next stage. There's no strategy to be found, because while different types of enemy tanks move in different ways and shoot differently, there is no telling what the broken AI is going to pull next; it's never a good sign when you get through several stages simply by shielding the tank and watching the dim enemy tanks take it without trying to escape. Every 10 levels you'll encounter a boss battle, which have one or more large tanks attacking (typically staying in one place, inexplicably) as several smaller tanks mindlessly ride around shooting at you. The best way to kill each boss, again, is simply to shield yourself as their blast approaches. There is no visual variety to be found in Touch Battle Tank 3D 2, and players comparing screenshots of the game with its predecessor will struggle to find anything different or updated. One would expect the visuals of each arena to change after each boss battle, but don't count on it — the only variety to speak of is the occasional pitfall or destructible obstacle. The blandness of the colours is made all the worse when the 3D effect is turned on; we found it dulled the look even more. The music is infuriatingly repetitive, with the same song looping over and over again on the menus, a similarly grating tune for the regular levels, and a slightly altered song for boss battles. You'll also quickly get used to the same shooting and explosion sound effects, which are both irritating and (luckily) forgettable. Menus, meanwhile, are busy, and there were several instances in which we accidentally started with Stage 1, as the menu doesn't automatically take the player to the latest stage. The most egregious aspect of Touch Battle Tank 3D 2, though, is its control system, which remains unchanged from the first entry. The tank is controlled with the Circle Pad, with shooting mapped to the touch screen. Since the action is on the top screen, your aiming will be imprecise and you'll often stop moving your tank so you can shoot with a touch more accuracy, but this will just result in a cheap death (which is why we stuck mostly to the defense tank). We quickly grew tired of aiming with the touch screen and were frustrated that there was no alternative option. 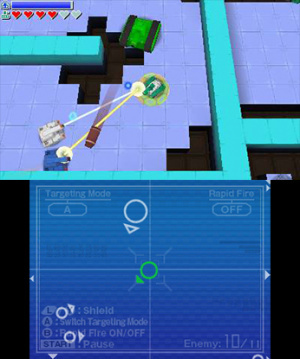 Touch Battle Tank 3D 2 is an unnecessary sequel that does nothing to expand upon or improve the first game. This is the type of game that smartphone users may download for free, play for five minutes and delete, never to be thought of again; that it's on the eShop with a relatively high price is yet another reason to avoid it. There are a ton of great, pick-up-and-play titles on the eShop that offer loads more satisfaction than you'll find here. Like its predecessor, Touch Battle Tank 3D 2 is a misfire. Wow, I auctually like the original. The first one was completely underwhelming. No reason to waste money on this one. The later the reviews, the worse the game gets. It is an ok game, I have downloaded games with higher scores and enjoyed them less. 6/10 for me. I totally disagree as well. I dug the original and I dig this one as well. It deserves at least a 6 or 7.